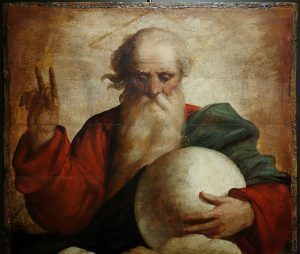 Before my conversion, my idea of God the Father was that of an old, white-haired man with an eternal scowl on his face who had a bad habit of turning people into salt, sending disgusting insect plagues, and getting so mad that He once wiped out everyone on earth except for one boatload of survivors. He didn’t seem like a very nice guy, especially to those who refused to obey His commandments – such as myself at the time – which is why I had a habit of avoiding windows during thunderstorms. He did, in a variety of brilliant and breathtaking ways that I describe in great detail in my book, We Need to Talk: God Speaks to a Modern Girl. But something even more momentous happened to me that night – God stopped being an angry old man and became someone who actually cared. From that moment on, he was no longer the man with the eternal scowl. What I felt that night was unmistakable. It was pure love. I had been touched by something – or Someone – and it was the touch of a father. This was the beginning of my devotion to God the Father. It was born in the earliest days of my conversion and has remained with me ever since. When I came to Him, I was in a very dark place, so He saw the worst in me – and yet He still cared – just like a Father would. Anyone who has ever come back from the brink of personal destruction knows the kind of deep bond that is formed with the person who became their lifeline at such a time. This was the kind of bond that was formed between myself and God the Father. I hid nothing from Him and trusted Him with my life. And so, as I continued my reversion back to the faith, it was only natural that I would be attracted to the writings of St. Therese of Lisieux who shared this great love of God the Father. It was she who taught me that because God has the heart of a father, He can always be “taken” by the trust of His children because this is something a parent simply cannot resist. Because of this, it was entirely okay to remain little, “to recognize our nothingness, to expect everything from God, as a little child expects everything from his or her father,” she taught. Now don’t get the wrong idea. This is not an endorsement of slackers. Therese is referring to the spiritual reality in which a person gradually learns that the more they depend on God, the humbler they become, and the more filled they are with His grace. Although we might be tempted to take advantage of this soft-spot in our Father’s heart, ultimately, we would only be fooling ourselves. This is because, even though His desire is “that we should be called children of God” (1 John 3:1), it is only through Christ that we share in this divine sonship. Jesus is the first-born and our job is to become more like Him – a task that is not exactly suited to slackers. 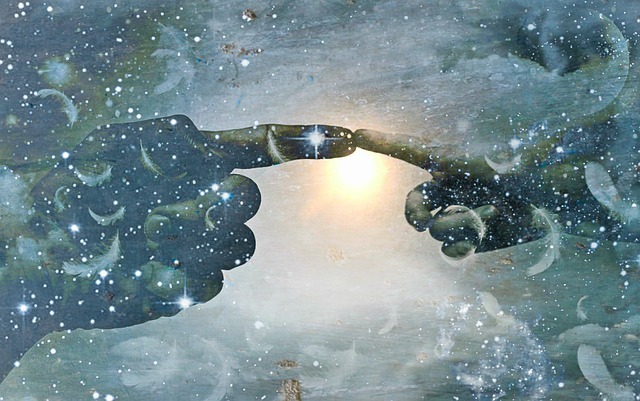 “The more like Jesus we become, the more God the Father will see us as his children,” writes Father Francis Fernandez in In Conversation with God. In other words, the more we live like Jesus did, loving the people we encounter each day, making reparation for sin, showing our thanks and, most importantly, imitating Christ’s trust in His Father’s will, the more we will be able to “tweak” that soft-spot in our Father’s heart. Even though I had no idea what I was doing so early on in my conversion, the Little Flower still managed to teach me an essential lesson in the spiritual life – that we must develop this filial relationship with God the Father. As Father Frederick Faber wrote in his book, All for Jesus, so much stunted growth in the spiritual life may be traced to an unaffectionate view of God. “You must get clear of this,” he writes. “You must cultivate a filial feeling toward Him. You must pray to the Holy Spirit for His gift of piety, whose special office is to produce this feeling…. You will never be right until your view of God as your Father swallows up all your other views of Him….A man could do no better than to devote his whole life to be the apostle of this one idea: the compassionate paternity of God” (195-196). 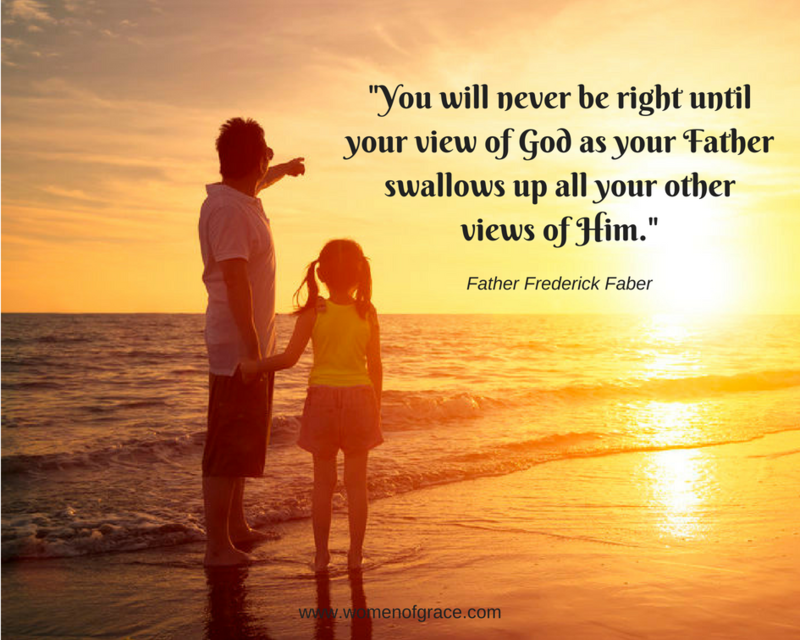 Father Faber aptly warns that if our predominant view of God is that of an “uncompromising law-giver,” it will hold us back from growing closer to God. Our predominant view of God must be that of a tender, loving Father. But what about those people who had difficult relationships with their father on earth and don’t know what the image of a good father is? What if they were neglected, abused, or treated harshly, so that the mere mention of the name “father” makes them shudder? God is more than capable of healing us of our father wounds. In fact, He is more anxious to heal us than we are to be healed. What better time than Father’s Day to ask for this healing and to begin our journey into the “father’s heart” of our God? Regardless of where you are in your relationship with “fathers” – either God or human or both – take some time in prayer to call out to this Father like I did one night in the depths of despair. Go for that soft-spot in His “father’s heart” that just can’t resist the cry of his child. Go ahead and give it a tweak! And may you discover, as I did so long ago, that regardless of how our fathers behave here on earth, in heaven we truly have a Father like no other. Did you have a difficult relationship with your father that left you wounded? In this series, “The Father Wound: Healing and Hope,” Father Philip Scott discusses exactly what a father wound is and how we can be healed and made whole through the love of our God.